The procurement department is a function that is found in most of the companies, whichever their type and industry: it is not limited only to manufacturers of products and goods, but is also a business unit for services companies, working with freelancers, agencies, etc. It is a strategic function linking the needs of a firm, and the suppliers or contractors. It plays a key role in the competitiveness of an organisation. 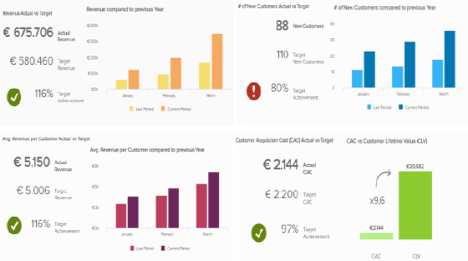 Our first procurement KPI dashboard provides an overview of the various metrics a procurement department works with. 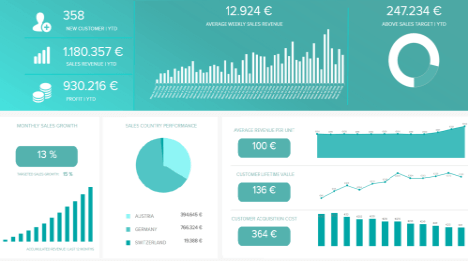 The first KPIs displayed are some statistics about the suppliers. Among the 804 suppliers, 61% are contracted, meaning that they agreed with the compliance contract of the contracting company, while 39% preferred not to settle on basic agreements – but still work with the company, as unlisted suppliers. These basic agreements encompass various requirements such as the delivery time, the reaction time, special discounts, etc. The contracted suppliers can then be classified and get certain partner status like gold, silver, or bronze – usually awarded to the ones that provide the company with good terms of agreements, interesting discounts, who take care of the relationship with the company. On the right part are exposed the costs and savings trends over five years. We see that the suppliers account for over two million euros in spending, but that the procurement department managed to save more than €96,000. 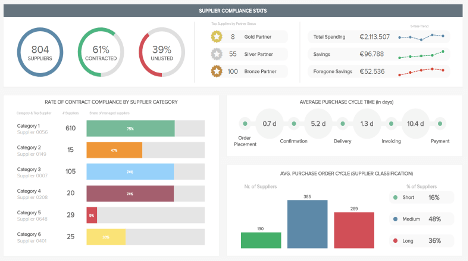 The second KPI displayed on that procurement KPI dashboard focuses on the compliance rate per category: the highest compliance rate goes to the first category, that also has the highest number of suppliers, with 75% rate of contract compliance for 610 suppliers. The lowest rate goes to the fourth category with 9% contract compliance for 29 suppliers. 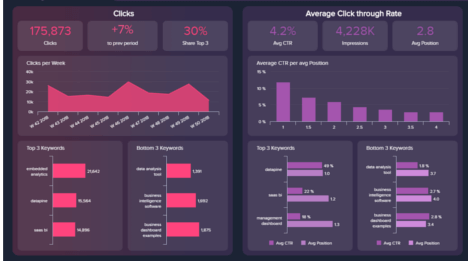 Moving forward onto the final metric on this procurement KPI dashboard, we have an illustration of the average procurement cycle time expressed in days. This cycle time covers the end-to-end ordering process, from the order placement to the confirmation, order delivery, and finally the invoicing. Here, we see that the overall average is of 7.2 days, with the moment between the confirmation and the delivery of the order for the invoice being the longest (5.2 days). 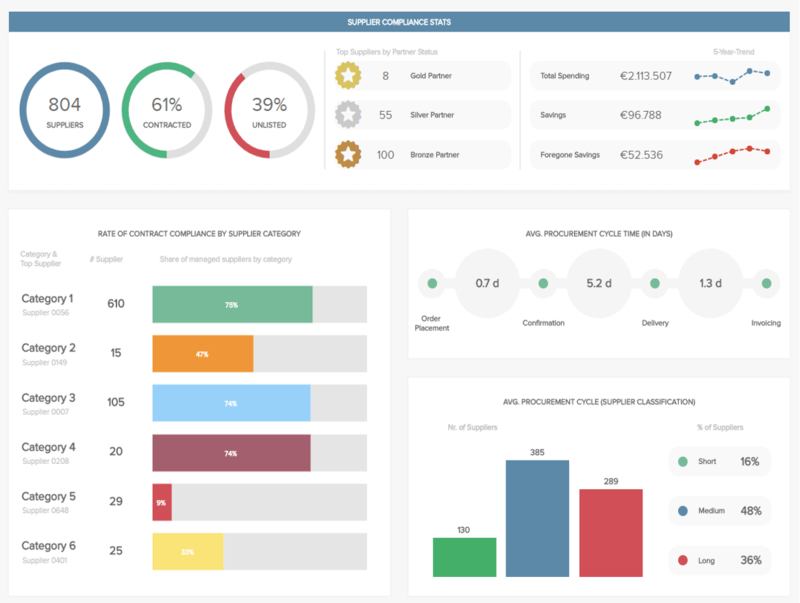 Working with interactive dashboards summarising the procurement department's activities and relationship with suppliers, or highlighting procurement's actual results (as we will see on our last dashboard) will not only help in managing the department, but also in building its brand. 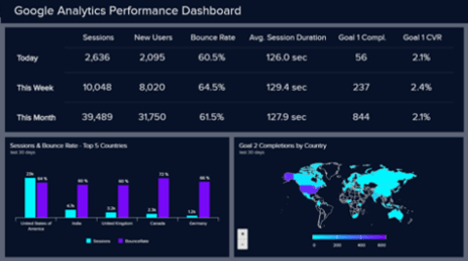 These dashboards are a real help for top management decision-makers and strategy builders. 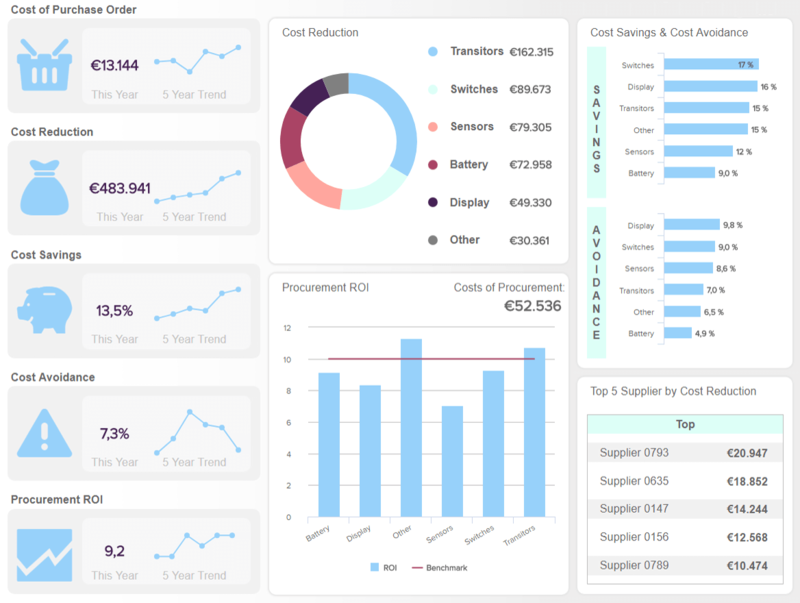 Having an overview and monitoring all your processes from purchase orders management to knowing your different types of suppliers will let you optimise your procurement process and more generally, the profitability of your company. 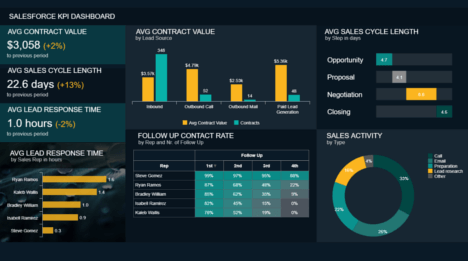 Our second procurement dashboard focuses on a supplier’s ability to provide you with the right products or services, at the right moment. 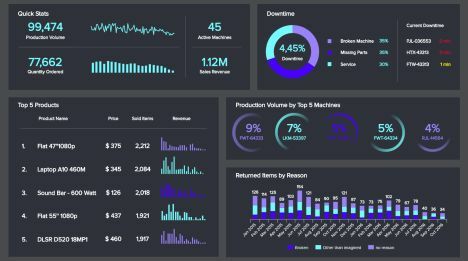 The first KPIs displayed at the top give an overview of one supplier’s performance, while the lower part of the dashboard is a snapshot of the overall performance of several different suppliers. 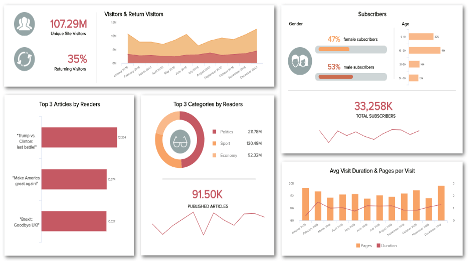 With an interactive dashboard tool like datapine's, you can easily add filters on your dashboard and focus on a specific supplier's performance, compare it to others or to the overall. The defect rate is a metric used to measure how many products received are not meeting the quality requirements and compliance specifications. For this particular supplier, it is of 1.9% and the trend line has been rather irregular over time; he or she managed however to maintain that rate under the maximum defect rate of 2.5% except in two points. This defect rate can be further compared to the rest of the suppliers with the bottom left chart displaying each supplier’s defect rate broken down into types of defect. The supplier number 1 is obviously more reliable than the others, as it has 1% of defective products and 80% of them have no impact (meaning that the defect might come from another part of the process, like a delivery issue or a payment issue). 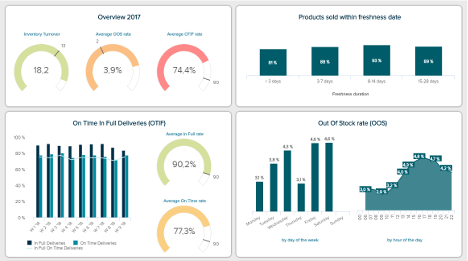 Moving on to the second top KPI, on this procurement dashboard example our focus-supplier has 85.3% of on-time supplies, which is within the range pre-set, and an average of 93.5% availability. 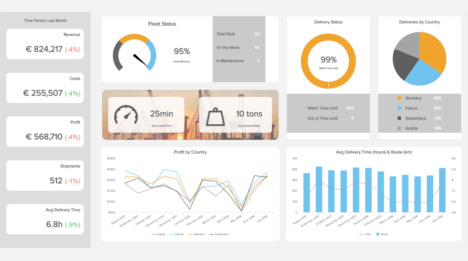 The supplier's availability: it evaluates their capacity to respond to demand by measuring the number of times good were available on their side. It gives you an idea of the reliability you can place in your suppliers, and should ideally stay over 90%. 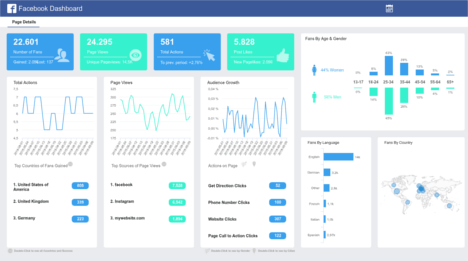 For our specific supplier; the evolution of the availability has also been uneven over the last 12 months, and was recorded three times beneath the minimum of 90% availability. However, since then, it has only been on the increase. 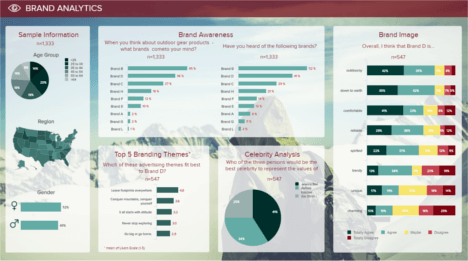 Another important metric is the lead time. Expressed in days, it refers to the capacity to fulfil an order, from the initiation to the execution of the process. Lead time differs from purchase order cycle time because it encompasses the whole process until the delivery. 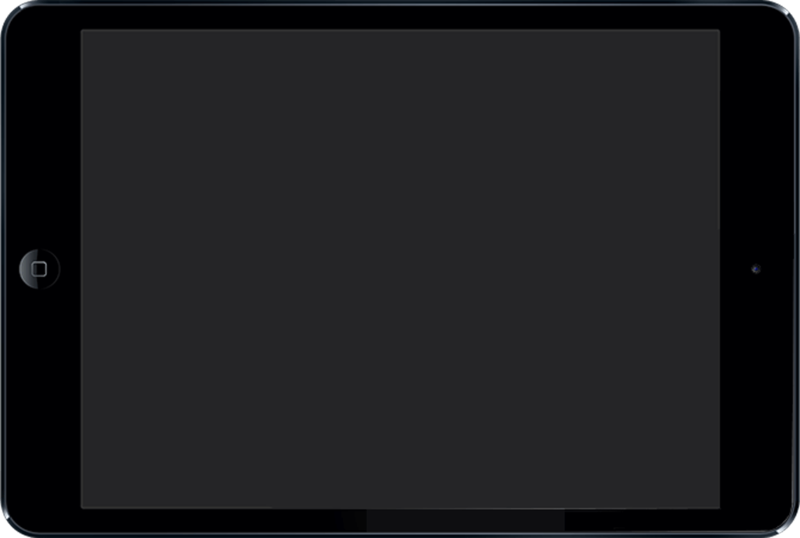 Here, the lead time is of 15 days and a maximum value of 16 days, that got exceeded twice. If the lead time keeps on growing, measures should be taken to address the potential issues. 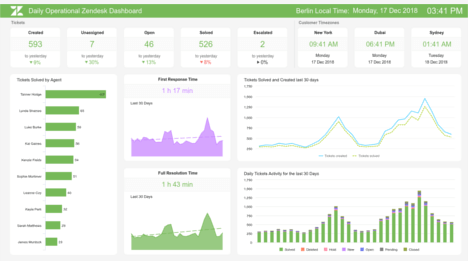 The last of our metric on this procurement dashboard is the delivery time. Just like for the defect rate, the delivery time is analysed parallelising several other suppliers. 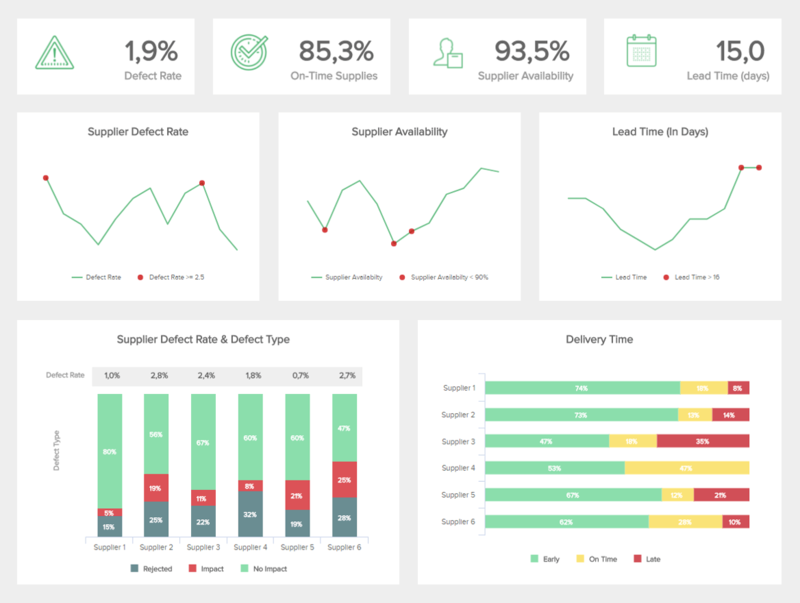 On overall, the supplier 4 performs better as it doesn't have any delayed supply even if it has fewer early delivery than supplier 1 for instance, with 53% early against 74% for the supplier 1 – that one still has 8% of his supplies delivered late. 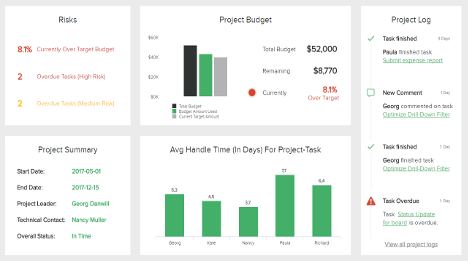 Our last procurement dashboard template aims attention at the costs and purchases. 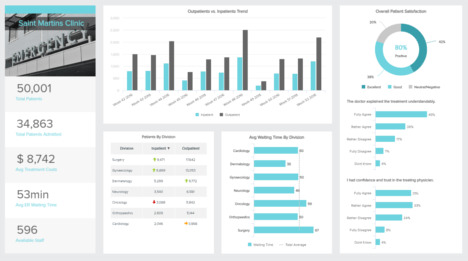 In order to optimise said costs, and anticipate the needs of the different business units to save valuable time, it is essential to oversee the entire purchasing area in one central place. 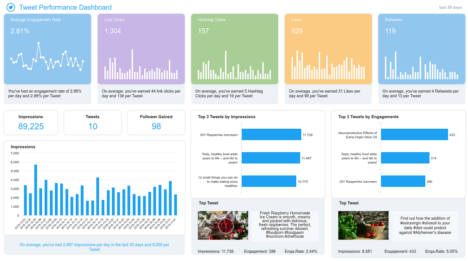 The first column gives a snapshot of all the metrics related to the costs and savings, that are further detailed on the right side of the dashboard. First of them gives us an idea of how expensive is the internal process of an order, from its creation to the invoice closure. Here, we have the entire costs of purchases displayed and their trend over five years, which tends to increase – maybe simply because the total amount of orders increases too. 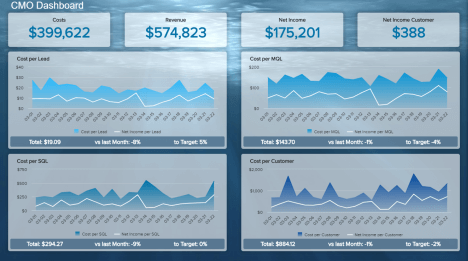 Beneath are two other metrics that actually convey the same information, but expressed in two different ways: the cost reduction and savings. Cost reduction can be measured easily by comparing directly the past costs versus current cost for the same goods or services, over the same period of time. This year, the cost reduction amounts to €483.941, which is expressed as a percentage with cost savings of 13,5%. 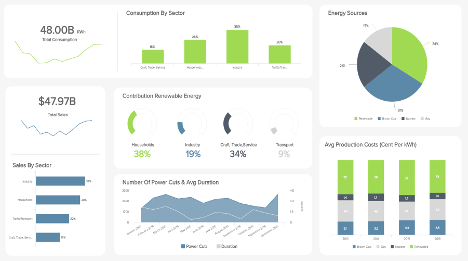 This procurement dashboard breaks it down into several categories (switches, battery, display…), to identify more easily any rationalisation opportunities. 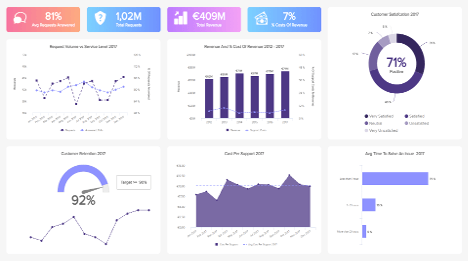 It plays a key role within the procurement department, as it measures the "hard savings" realised over time, and helps in monitoring the financial performance of the purchasing function. Top management uses this figure because it has a direct impact on the profit and loss. Ideally, it is a metric you want to sustainably increase in the long-term. 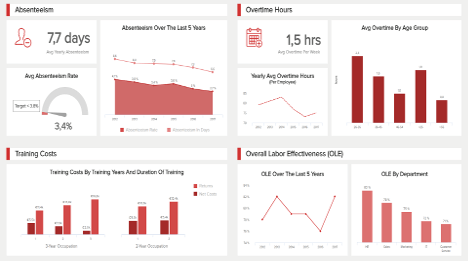 To continue, another key indicator on our procurement dashboard is unfortunately too often overlooked by top management, because it does not directly affect the income statement and does not appear on the bottom line in a tangible, quantifiable way. Still, the cost avoidance has a positive impact as it represents all the potential future costs avoided by certain measures, like replacing parts of an equipment before they fail and damage other parts, or negotiation successes bypassing cost increases on future purchases. These soft savings are thus creating strategic value by targeting strategic spends like new investments or new technologies. 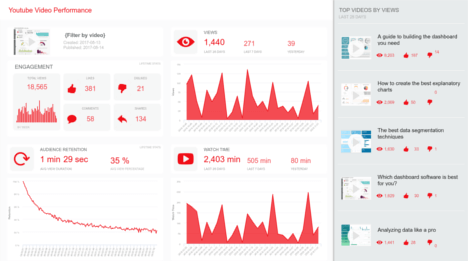 Monitoring them alongside the hard ones (of cost reduction) is a best practice to adopt, as we can see with the metrics on the top-left part of the dashboard, where they are expressed as a percentage. The cost avoidance for this year amounts to 7.3%. 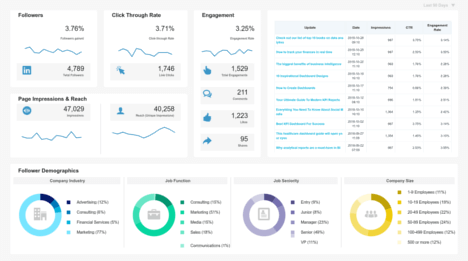 Finally, the central metric of this procurement dashboard is one of the most important ones when it comes to evaluating the actual worth of your internal procurement investments within the context of your company. It is not calculated as regular ROI (with the formula ROI = (Gain from investment – Cost of investment) / Cost of investment), but instead by dividing the annual cost savings by the annual internal cost of procurement, and is expressed as a ratio. This ROI should ideally have a massive payback of ten times for internal procurement investments. This year, we see that the procurement ROI is of 9.2, which is a little under the benchmark target, set at 10. 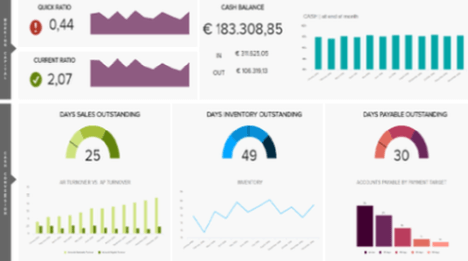 Most of the procurement professionals are used to working with raw data, and face difficulties extracting it from various sources – ERP software, databases, csv files, etc. Then comes the problem of presenting it in a meaningful way to stakeholders and decision-makers to allow them to easily understand the big picture and make sound decisions. 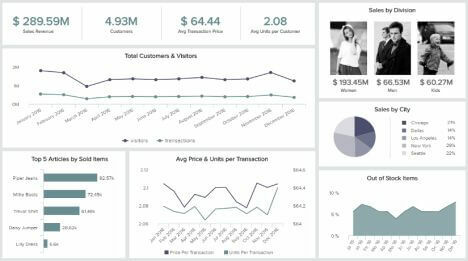 Using a modern dashboard software like datapine to create professional procurement dashboards is a way to overcome these difficulties and drive your performance forward.